For the last century the Sherman family has been producing toe tapping tunes for the radio, film, and stage, and now Robert J Sherman (the son of one half of the iconic Sherman Brothers) brings his fascinating and awe inspiring family history into the spotlight, in A Spoonful of Sherman. 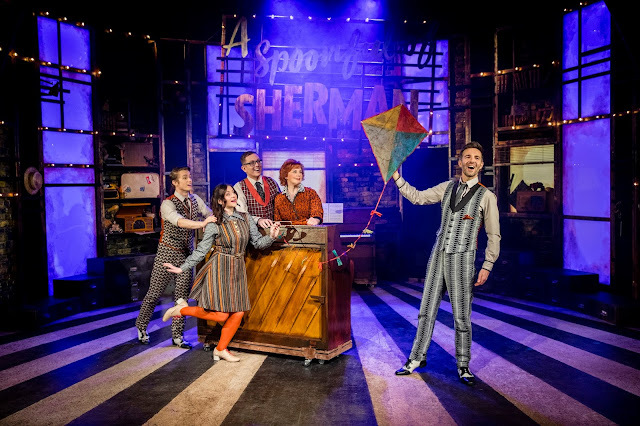 Featuring a quintet of enthusiastic and talented singers, A Spoonful of Sherman is a delightful musical stage show which intersperses the history of the Sherman Family with dozens of their most recognisable tunes, as well as plenty of underappreciated gems. Highlights include Al Sherman's Over Someone Else's Shoulder and What A Comforting Thing To Know from lesser known Sherman Brothers musical The Slipper and the Rose. Naturally though, the show takes off during the inevitable medleys from Mary Poppins and Chitty Chitty Bang Bang, two musicals which audiences of all ages are bound to be familiar with. Sophie-Louise Dann's gorgeous rendition of Feed The Birds is heartbreaking and thrilling in equal measures, meanwhile Mark Reid and Jenna Innes' Doll on a Music Box/Truly Scrumptious is a nostalgic offering so sweet Lord Scrumptious himself would probably like to get his hands on it. Additionally, Glen Facey's energetic performance as King Louie, singing and dancing to I Wanna Be Like You from The Jungle Book, brings the house down, and lead pianist Ben Stock is hilarious when embodying a cracker crazed macaw in his solo Crunchy Crackers, a tune from Robert J Sherman's own musical creation Love Birds. It's impossible not to be enchanted by A Spoonful of Sherman. Younger audience members may find the first section of act one a little dense, but by the time the songs made famous in Disney films start cropping up the whole audience will be bouncing with joy. Telling one fascinating family's history, the show is packed with unbelievable anecdotes and songs for all ages to enjoy. Don't miss this adorable musical experience.